Thanks to Barbara Segar, Nancy Long, Cherry Everett, Becky Fisher, Betty Kunstmann, Elizabeth Heimbach and Catherine Hicks for their help in providing FredCamp lunches from June 29-July 3. We have supported FredCamp with lunches for the past four years. A great outreach project! This year one of the sites was right in Port Royal- 7213 Royal Street. These pictures were taken by Catherine on the last day, July 3. Kentucky Fried Chicken and all of the fixings plus pizza was served and devoured. The Village Dinner is so well organized, well implemented that it is easy to take it for granted. 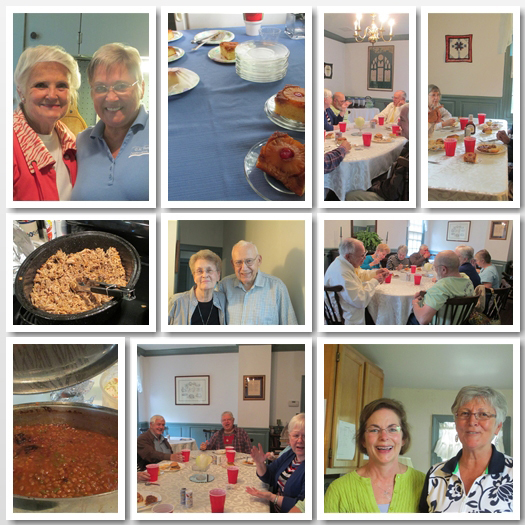 Thanks to Wendy, Eunice, Cookie, Cindy, Eunice, Clarence and Betty for their help in feeding 40-45 barbecue, beans, slaw and upside down cake on Wednesday. The best in sustaining fellowship. 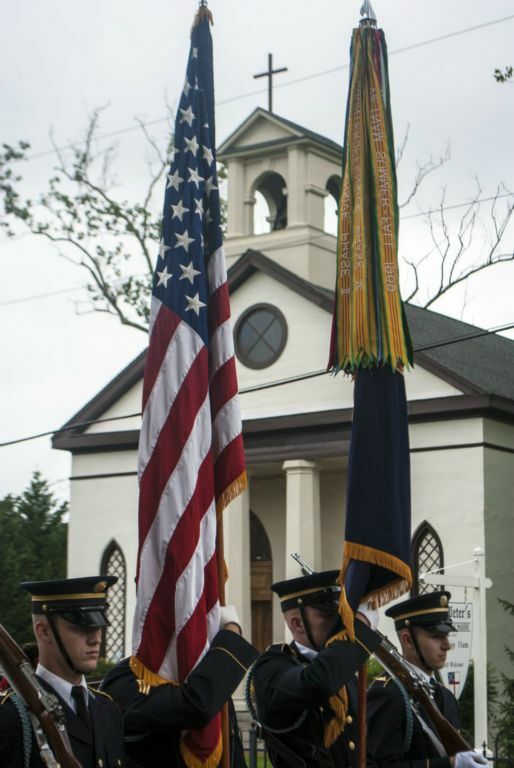 A Big Sunday at St. Peter’s, May 24 -1. Pentecost -3rd most important festival of the year along with Christmas and Easter|2. Bishop Goff visitation – bishop visitations happen once a year. 10am talking healing and then leading the service at 11am|3. 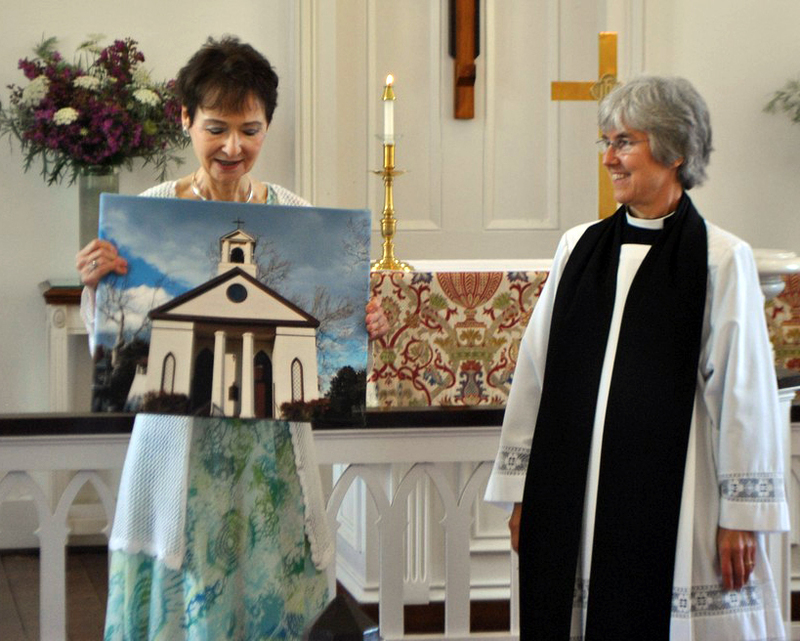 Baptism of Marie Elizabeth Duke|4. 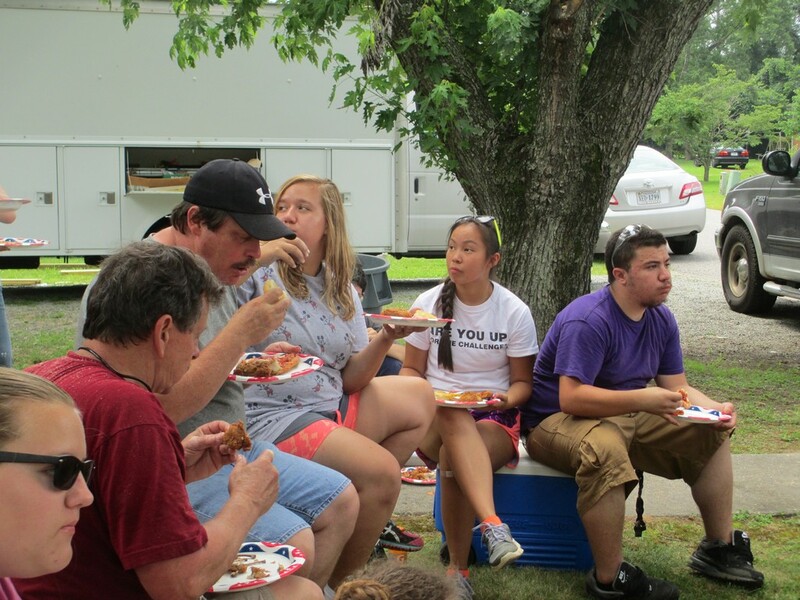 Pentecost picnic 12pm|And there were a few surprises beyond these. The day was glorious – full sunshine, low humidity. A perfect day! 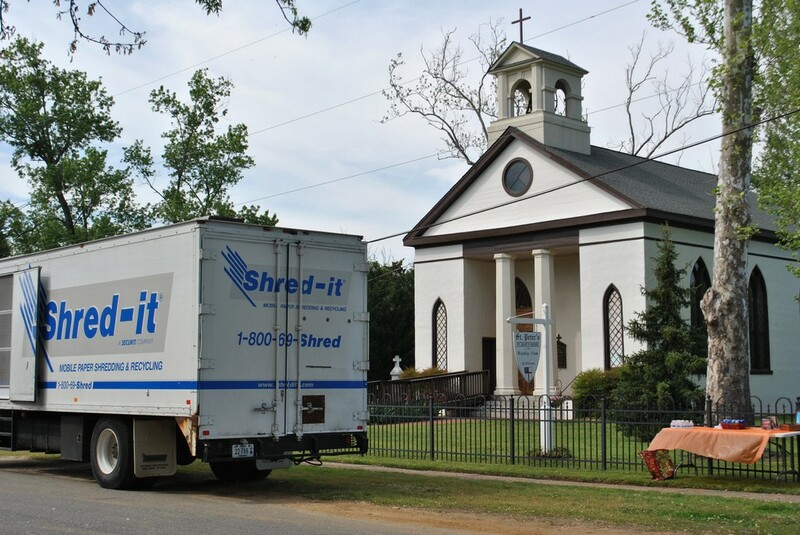 This was the 4th year of bringing our paper clutter to St. Peter’s to be professionally shred. It was a beautiful spring afternoon in Port Royal in the high 70’s under full sunshine. The iris were mostly in full bloom – all colors – yellow, purple, shades of red This year we collected $328 at Shred-It. After paying the Shred-it truck $225 we came out with a profit of $103 for St. Peter’s Outreach ministries. 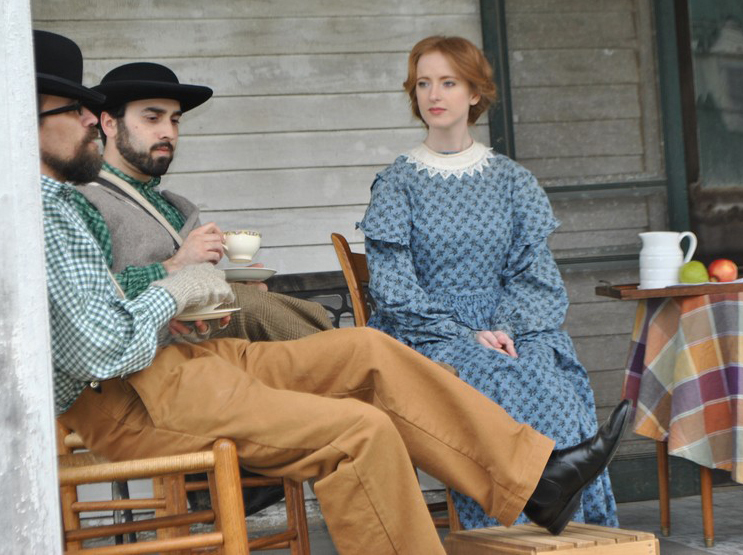 Laura Long and two reenactors portrayed the Booth arrival in Port Royal on April 24, 1865 at the Brockenbrough-Peyton home.After that they came to St. Peter’s. Hourly tour guides were available to add to Jim’s tour. Jim stressed the big dates in our history – fire, lightning attack and the recent creation of the belfry. Inside it was the organ, tablets and stained glass wnidows. 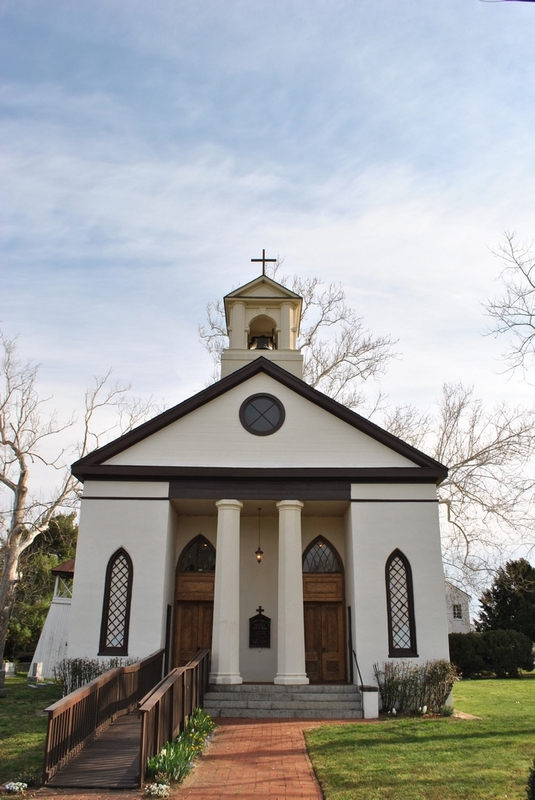 The stress was on St. Peter’s as a historical church and one involved in current ministries. 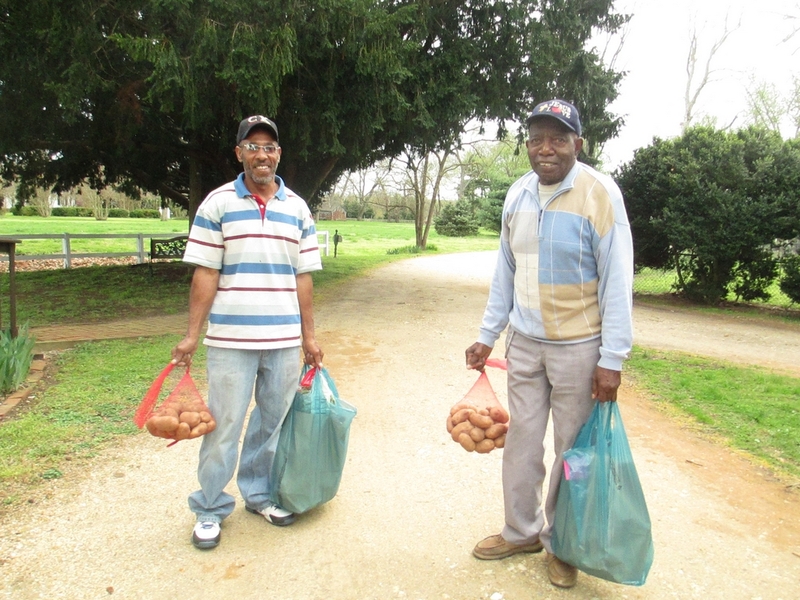 The Community Give on May 5 supporting our Village Harvest was promoted. 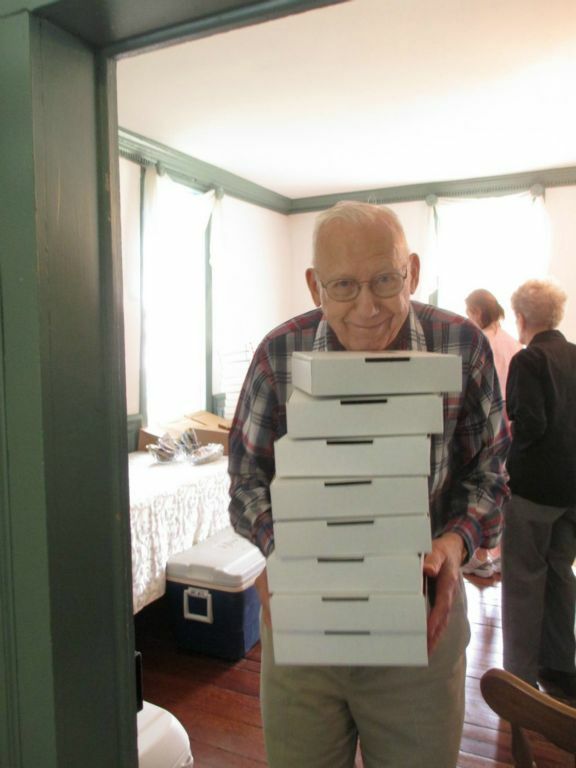 St. Peter’s through the help of the Royal Caterers (and hired help) provided box lunches for 175+ at Fall Hall. We gave tours of the church and also advertised our current ministries. During the tours we made $250 for a future tablet restoration and collected some funds for the Community Give on May 5. The meals provided just under $1,400 net profit. We had 61 at our 11am Easter service which is close to the average over the last few years. There were some notable contributions. Charles McGuire provided the wonderful flower arrangement up front with the lilies adorned with cherry blossoms and curly willow. Cally had a gold egg and a basked of easter eggs to share with the Godly play children. Bonnets galore – it was wonderful seeing Myrtle there. Other bonnets present included Cookie, Andrea, Cherry (back from Florida), Marilyn and Barbara.|Easter is a time of celebration and that included music with Josh Sylke on the trumpet echoing the hymns, Brad performing the intricate ” Prelude and Fugue in A-minor ” (Bach) and the Helmut adding “Alleluia” during communion. We had 17 people on an overcast day but warm in the 70’s. There was a “Good Friday” type of mood in the air – somewhat introspective thinking about what happened. Somewhat forboding looking outside. A severe storm was predicted but did not occur. In the midst of the gloom, spring is developing – the dogwoods are out, daffodils, hyacinths. The magnolia tree may be in full bloom at Easter.|After the sermon was the veneration of the cross, the dramatic entrance of the cross. It is slow but dramatic as it is raised and placed on the altar. Then a chance for prayer and to put a taper in the sand in the front and a rose in the vase. 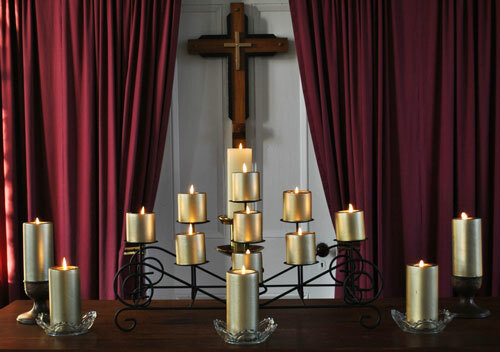 By the end there were 14 candles and many prayers said. 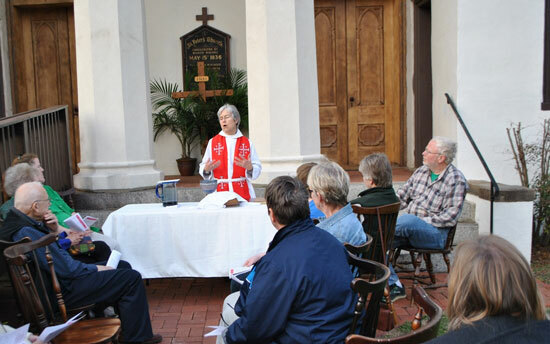 Our Maundy Thursday service on April 2 was handled differently this year. The crowd was small at 15 so that we could hold the first part of the service outside on a beautiful spring evening. Footwashing, homily, Liturgy of the Word, Communion were outside. After this we went inside for hymns – “What wonderous love is this”, “As in that upper room”, ” Jesu, Jesu, fill us with your love” and “In remembrance of me” and the stripping of the altar singing “Stay with Me” continuously. A full moon greeted us through the windows of St. Peter’s as we departed in silence. 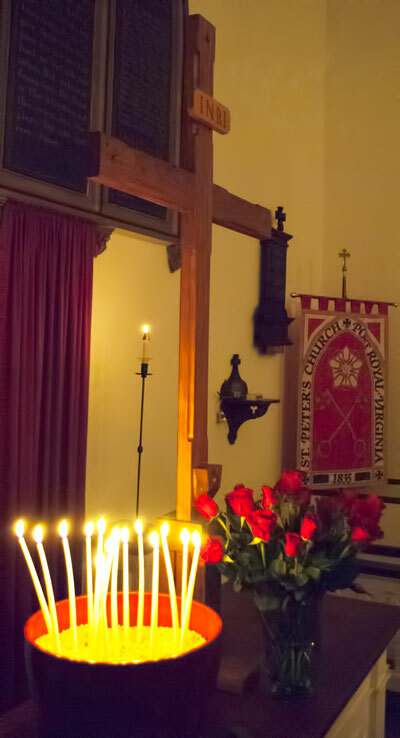 We had 18 at Tenebrae which was a good turnout, though two less than last year. This is an unusual service with its own Liturgy. There is only music – the readings carry the service. And it is not from the traditional Gospel readings. The readings range from Lamentations in the Old Testament to commentary from St Augustine, and at last a reading from Hebrews, in which the theology of Gods saving grace through Jesus Christ our great high priest is presented for our consideration. The Psalms dominate the service. Our Palm Sunday weather in 2015 was not spring-like except for the sun which was glorious. The temperature was in the high 40’s, reached the low 50’s but was windy|We had 47 but a smaller number for the Litany of the Palms. 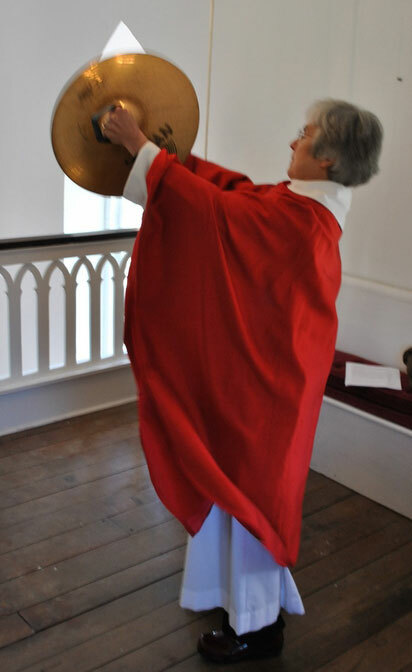 This year we had various noise makers including a cymbal to increase and highlight the fanfare.|Catherine’s opening homily focused on the concept of love in Holy week despite the tragedy – the annointing at Bethany, the Last Supper, Jesus toward God and the Centurion. Each forgot their own needs and served the other.